Making Self-Help work for YOU! What do you dream about becoming? There is probably a book out there for just about anything you have ever thought about. But how do you achieve your dream? Is reading the book enough? By reading this book you will see how to get the most out of the advice self-help books give. This is a realistic guide that shows you what works in real life and how you can create lasting change. 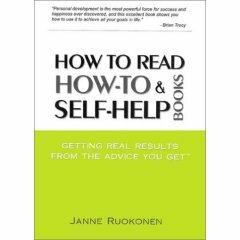 Janne has come to the realization that many books fail to show the reader how to take the advice and use it to achieve maximum results. He started collecting self-help books, interviewing people who used the books and participated in online discussion groups. He soon saw a pattern emerging. In the last section of the book, he lists page after page of books you will want to read. I’ve always thought a good book was one that recommends other good books! Janne also gives lists of what people are reading and listening to. Then he shows you how to read effectively and “actively.” I like that he says you should make notes and almost “review” the book. I’ve found that if I review a book I really do absorb more of the content. I’m not sure I could only read two chapters per week, but many people are probably encouraged if they can read two chapters of a self-help book each week. After all, that might not be all you are reading. Janne Ruokonen has worked as a manager and consultant. He knows how to put personal development ideas to work for himself and his staff and his career includes working at a leading personal development and sales training company. In this book you will realize that life is far too short to learn everything on your own by trial and error. Why not learn from other people’s mistakes or success? Who would have thought you would need a self-help book to read self-help books, but it makes complete sense. One of my main problems is that I tend to think Big and then try to take Big steps. That is why I’ve failed with self-help on numerous occasions. When I sat down and realized that each time I tried to get fit, I was jumping in too fast and exhausting myself from the onset, I started to realize that at time if you take smaller steps at the start, you will be able to more easily reach your final goal. You would think this would be obvious, but ambition can often blind you to reality. I mean, you can sit and watch a workout tape all day, but if you don’t get on the floor and start working out, it isn’t going to get you very far. Sure, the tape is fun to watch and review, but the satisfaction comes from looking in the mirror and seeing the results you have achieved. I also found that watching movies while walking on the treadmill keeps me more interested in walking. So, everyone had to find that secret way to motivate themselves. Rewards do seem to work. “How to Read How-To & Self-Help Books” is a balanced approach to achieving your goals, gives you the motivation to take the steps needed to improve your life and shows you how to realize your dreams! Learning to take care of our bodies by eating correctly and exercising seems a true journey all on its own. When you decide to incorporate a style of meditation into your life then a whole-body Vipassana might bring you more peace of mind. It is a sensation-based style of meditation. 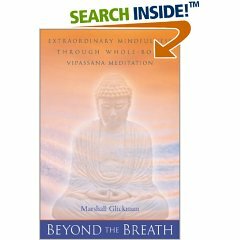 There are chapters filled with instructions on how to meditate, but the real highlights of this book are the insights into living life effectively and understanding how our bodies function on the chemical level. If you have trouble settling into a meditation session, do yoga first. It helps your body to work out all the extra energy that might keep you from sitting still. You can also meditate while reclining in bed or while sitting in a chair. You don't have to meditate in a guru-style seated position. I normally meditate while laying flat on my back after an invigorating yoga practice. Some of the most blissful happy places I've ever been have been after doing a Chakra Yoga workout. I finally understood the place meditation could take you. I like imagining colors inside my body and working with sensations and the release of negative thoughts. I've noticed that when I do meditate I think more clearly and can solve problems more effectively. When I don't meditate, chaos creeps into my life. After reading this work, you may also enjoy Tobin Blake's "The Power of Stillness: Learn Meditation in 30 Days."